Call it symbolic or call it coincidence, but the Chicago Bulls' Scottie Pippen, playing without Michael Jordan for the first season in his career, affirmed his place among the league's elite when his 29 points, 11 rebounds, and 4 steals led the East to a 127-118 victory at the 44th annual NBA All-Star Game in Minneapolis. Pippen dazzled a capacity crowd of 17,096 at the Target Center, earning unanimous selection by an 11-member media panel as the game's Most Valuable Player. Pippen's 9-for-15 shooting night included 5-of-9 accuracy from three-point range. He finished one three-pointer shy of the All-Star record of six threes in a game, set by Mark Price in 1993. In fact, the East's 10-for-24 performance from long range set records for both makes and attempts in an All-Star Game. Price and Patrick Ewing added 20 points each for the East squad, while B. J. Armstrong and Dominique Wilkins tallied 11 points apiece. 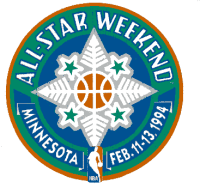 Hakeem Olajuwon and David Robinson starred for the West with 19 points each. Shawn Kemp had a game-high 12 rebounds, and John Stockton led all players with 10 assists.